I Love Las Vegas Magazine...BLOG: Grand Opening of Center Mass Firearms Coming Up! Raffles, Food-trucks & More! Grand Opening of Center Mass Firearms Coming Up! Raffles, Food-trucks & More! The Range 702 Range Masters alongside X107.5 Las Vegas’ Dave Farra from The Dave and Mahoney Morning Show present the grand opening of Center Mass Firearms, a professional gun training and firearm retail store. With raffle items including a 1-year gun range membership, 12 CCW courses, and Mossberg 22lr AR15, the event is expected to draw hundreds of firearm enthusiasts in the Vegas/Henderson area. In celebration of the newest firearms dealer in Henderson, Center Mass Firearms’ grand opening event festivities will include a carwash featuring the girls from Cheetahs Las Vegas, which will benefit America Helping Heroes, a charity dedicated to the well-being of post 9/11 combat veterans; an aerial stunt flyover from Sky Combat Ace; and a live raffle with over $3,000 in prizes. Guests are invited to order from Zagat-rated “25 Best US Burgers” foodtruck, Slidin Thru, which will be parked outside the 4,500 sq. ft. facility. Event sponsors include Valkyrie, The Range 702, Rockstar Energy Drinks, Force Options, Archangel Training Solutions, KVAR, Exclusive VIP Transportation, Sky Combat Ace, Pro Gun Club, and Boulder Choppers. Center Mass Firearms is a veteran-owned and operated firearms retail store and state of the art indoor firearms range located in Henderson Nevada. Center Mass sells guns, ammunition and services to the Las Vegas and Henderson area through its location in Henderson, NV and services the United States through our website. 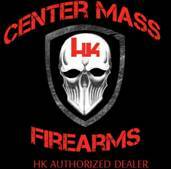 Center Mass Firearms is a direct authorized dealer for LWRC, Heckler & Koch, Gemtech, CCF/ Swiss, Noveske, Vihtavuori, Lapua, Tactical Tailor, Eagle Ind., A.R.M.S., Inc., SureFire Lights, Blade Tech, Galco Holsters, Sig Sauer, Smith & Wesson, Benchmade, Buffer Technologies, and Vltor Weapon Systems. Easily accessible for locals and tourists, Center Mass Firearms is open seven days per week from 9 a.m. until 7 p.m. Guests must be 18 years or older with a valid ID to shoot. Children must be 10 years of age or older and must be accompanied by a parent or legal guardian. For more information on Center Mass Firearms and available classes, visit www.centermassfirearms.com. The Range 702 is the largest indoor shooting facility in Nevada, located in a 55,000 square foot shooting range at 4699 S. Dean Martin Drive in Las Vegas. Featuring 25 shooting lanes that incorporate the latest advancements, equipment and technology in the firearms industry, a seven-lane VIP room complete with leather couches and chairs, pool table, darts and big screen televisions, an extensive line of guns for rent and sale, gunsmithing services, firearms safety and training classes and the state-of-the-art PRISim system. Easily accessible for locals and tourists, The Range 702 is open seven days per week from 9 a.m. until 7 p.m. Guests must be 18 years or older with a valid ID to shoot. Children must be 10 years of age or older and must be accompanied by a parent or legal guardian. For more information on The Range 702 and available classes, visit www.therange702.com.